I've been looking forward to this review for a long time. 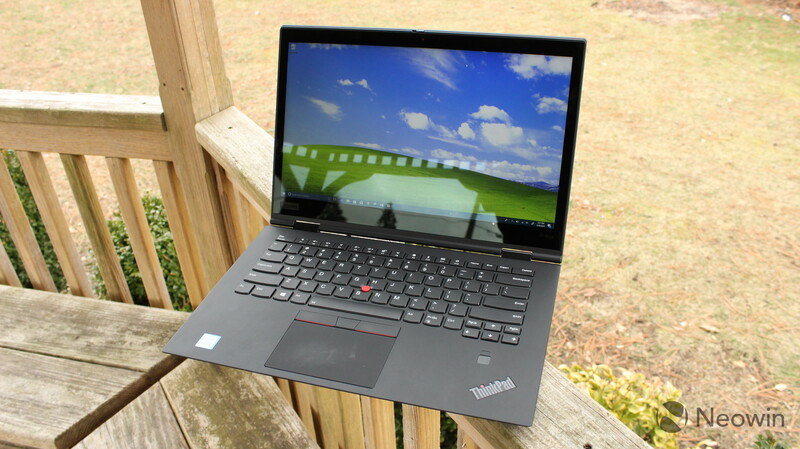 Well, I've been looking forward to it since last July, when I reviewed the second-generation Lenovo ThinkPad X1 Yoga. 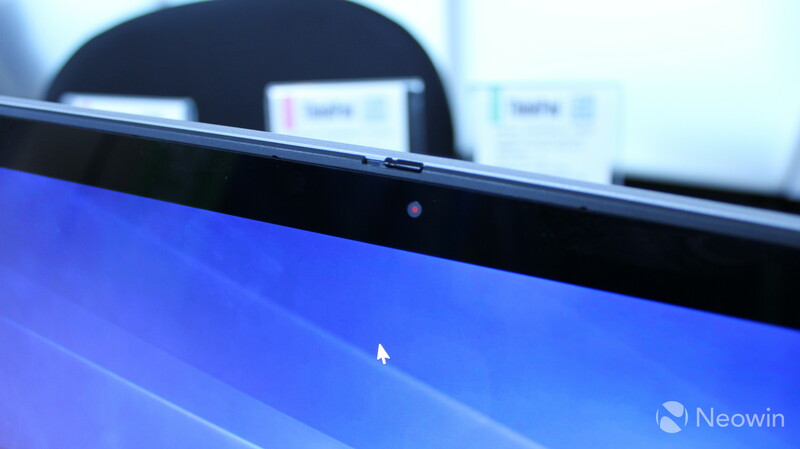 It's one of my all-time favorite mobile PCs, and when I reviewed the OLED model in October, I said that it was damn close to being perfect. 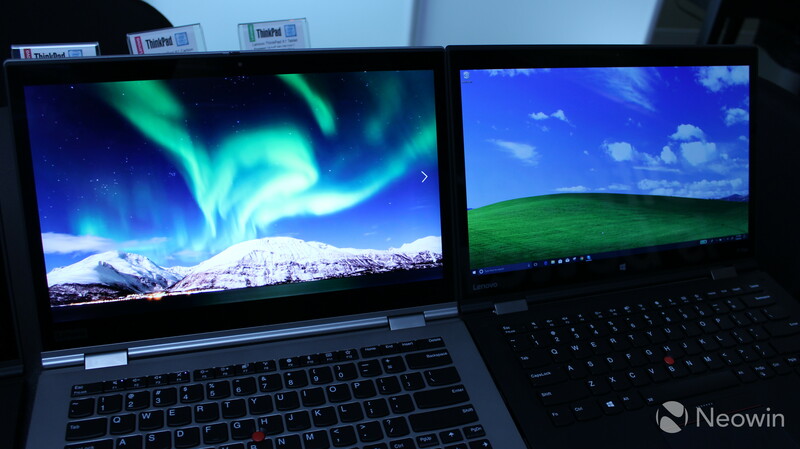 Announced at CES in January, the third-gen model is here, and I was psyched for it. 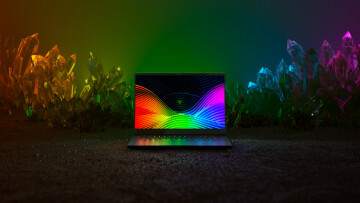 The new models include Intel's eighth-generation U-series processors, meaning that they're quad-core now instead of dual-core. 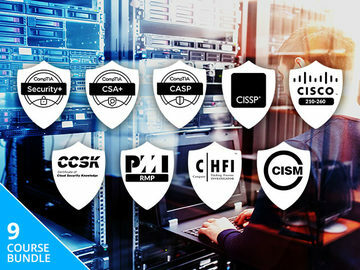 This means that you can see a 30%-40% performance boost depending on your workload. 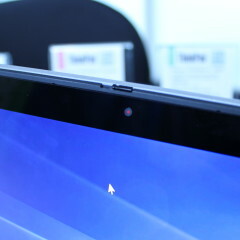 There's also a privacy guard on the webcam, called ThinkShutter. Now, you won't have to put a piece of tape over it to protect your privacy. 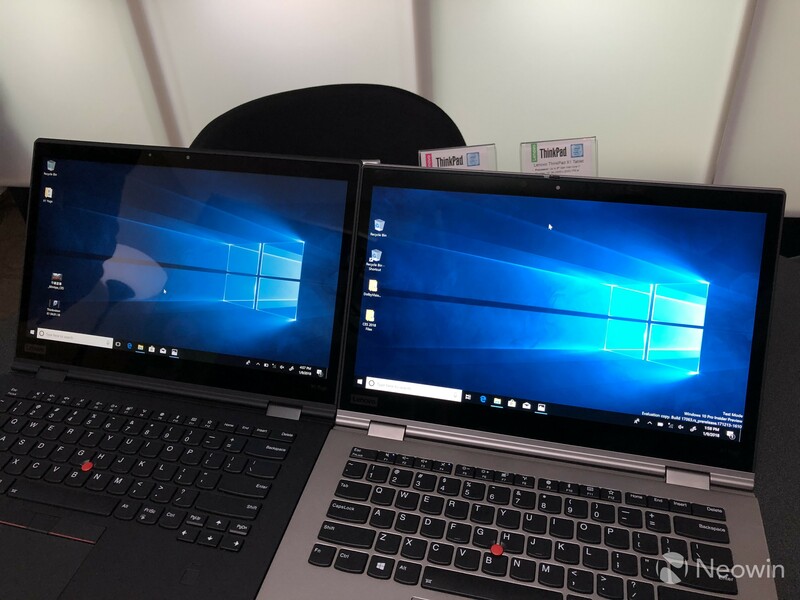 Unfortunately, there's no OLED model this time around; instead, Lenovo went with Dolby Vision HDR. I was sent the 1080p non-HDR model, so this review will be more of a successor to my first review of last year's model. 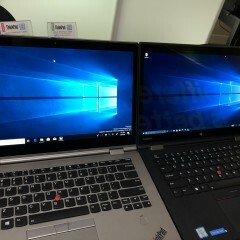 Hopefully, Lenovo will send me one of these magnificent Dolby Vision PCs sooner rather than later. 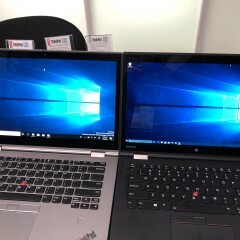 If you want to check it out, I did compare OLED to Dolby Vision when the X1 Yoga was demoed for me at CES. 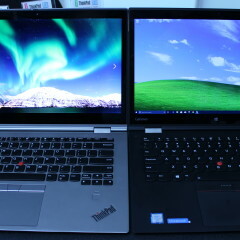 But ultimately, the third-gen ThinkPad X1 Yoga is pretty much the same as last year's model, with some improvements. In other words, it didn't disappoint me. 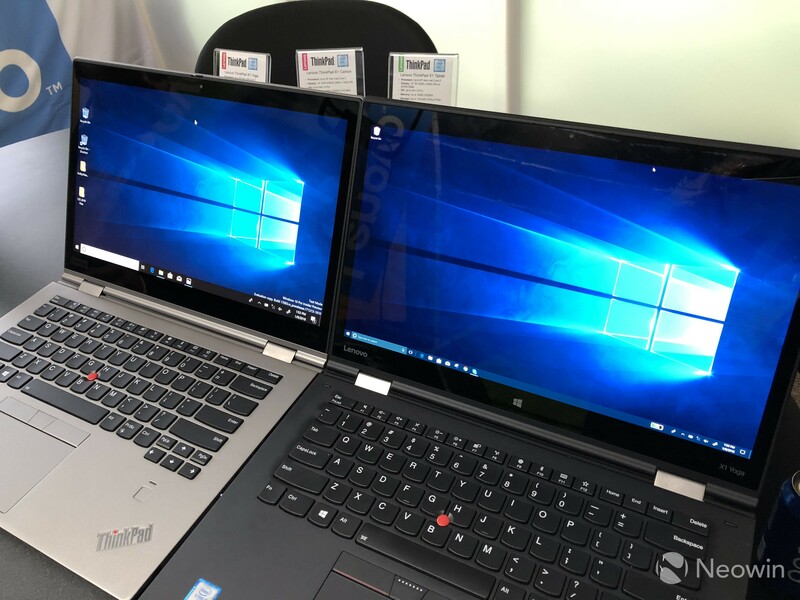 Aside from a QHD model with Dolby Vision, you can also configure the ThinkPad X1 Yoga with an IR camera for Windows Hello, but we'll come back to that later. 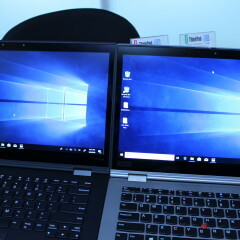 Also, you can get it with up to 16GB RAM and a Core i7. 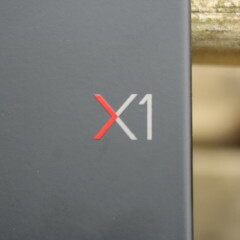 I thought it was cool that the X1 Yoga comes in a nice box like that. 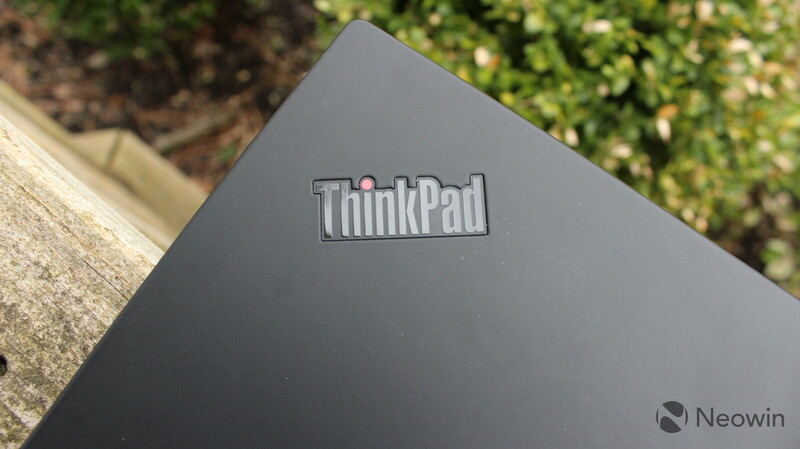 Most business laptops, including every other ThinkPad that I've reviewed (there are a lot), come in a basic cardboard box. This is because in businesses, the user rarely ever even sees the box. 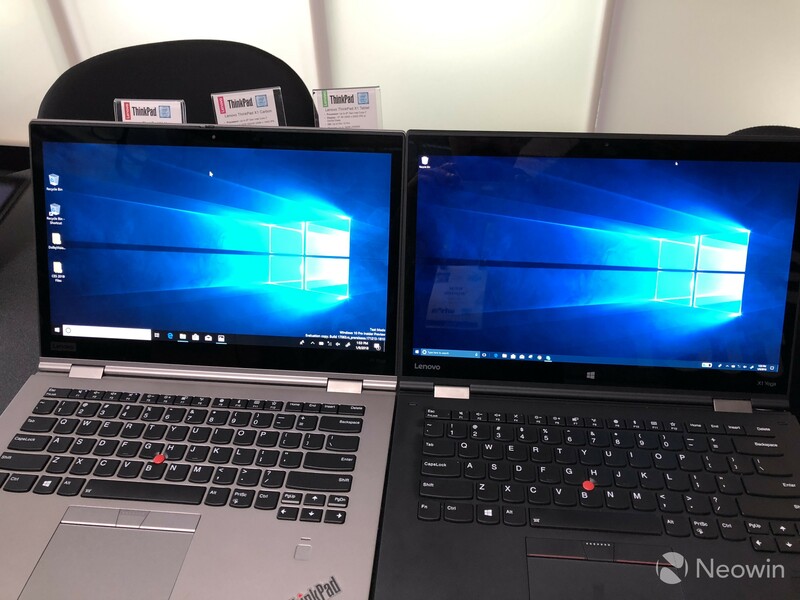 There are some subtle changes to the design this year, and I can't tell you how proud Lenovo was of this when I spoke to them about it in January. 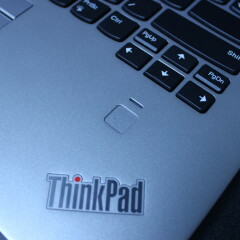 For one thing, there's a new ThinkPad logo, which is a chrome color instead of the old greyish-silver. 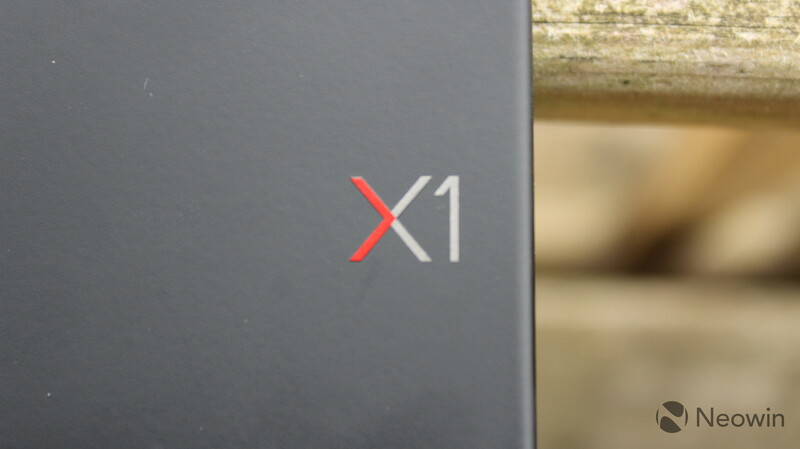 There's also a new X1 logo, which replaces the Lenovo logo. 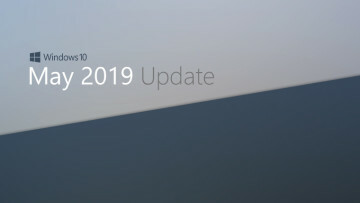 Finally, this year's model is black. Oh, you thought that last year's was black? Well, this is blacker than black. 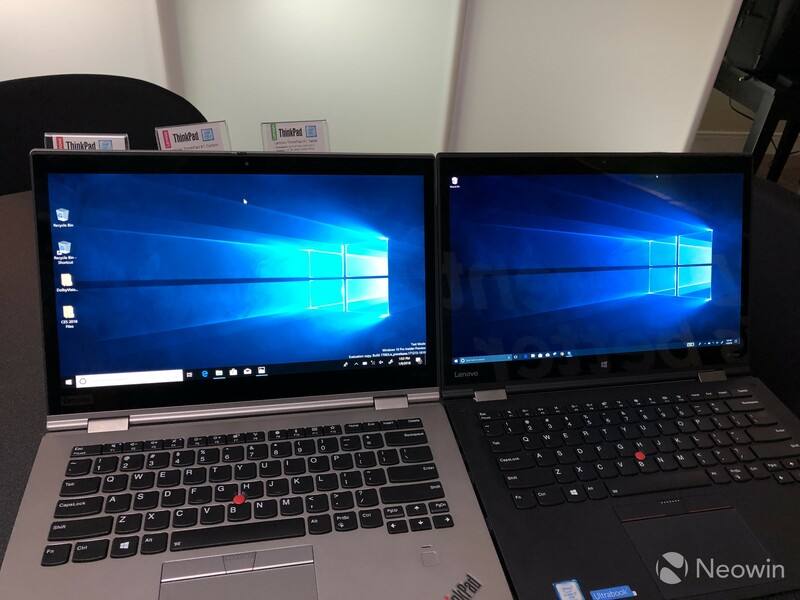 That's right; Lenovo darkened the device a bit more, and you'll also find that the hinges are black on the new X1 Yoga, rather than the silver hinges you'd find on the second-gen model. 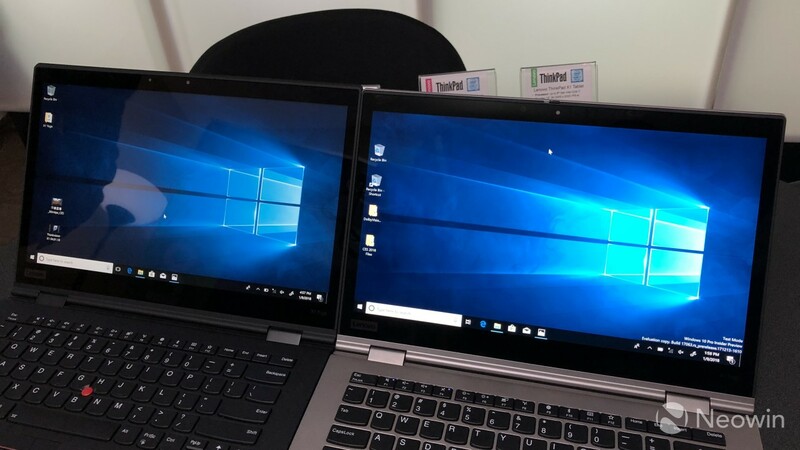 On the left side of the device, you'll find two Thunderbolt 3 ports, both of which can be used for charging, and a single USB 3.0 Type-A port. 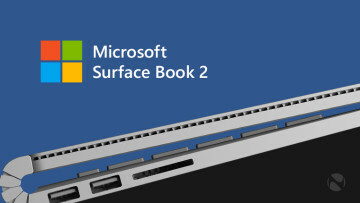 This is disappointing to me, because there were two Type-A ports on the left side last year, so one was dropped, seemingly without reason. 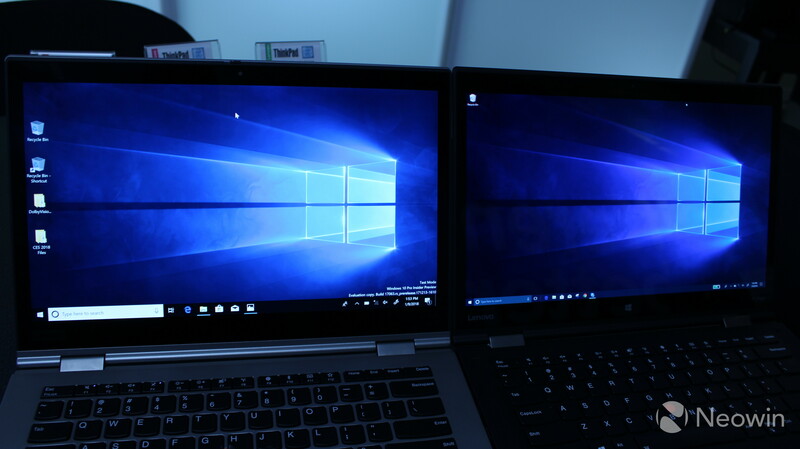 A pair of Thunderbolt 3 ports is always good though, as they can each support data transfer speeds of up to 40Gbps and power two 4K monitors. 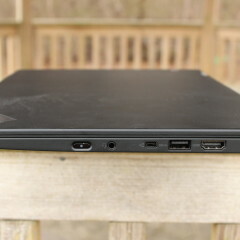 On the right side is a second USB 3.0 Type-A port, along with HDMI-out, a 3.5mm audio input/output jack, a Kensington Lock, and Ethernet. 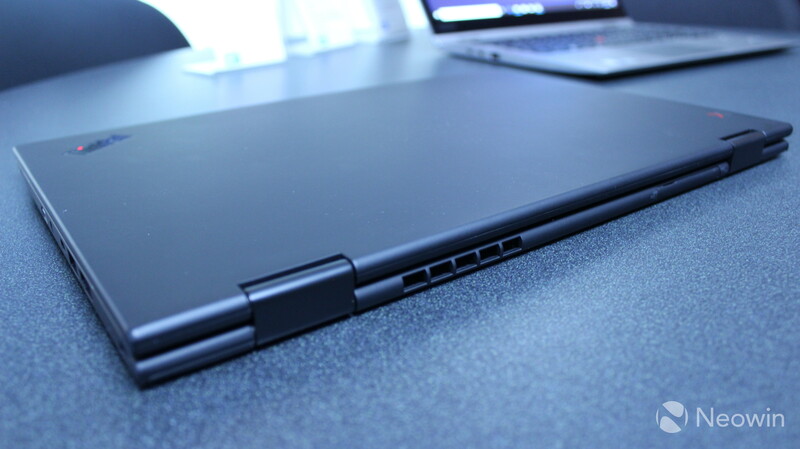 This is also where you'll find the power button, and the ThinkPad Pen Pro, which has its own dedicated storage compartment in the device. 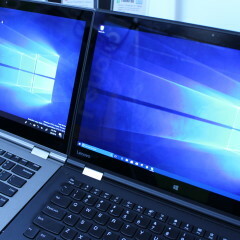 The interior of the device is the same as it was last year. 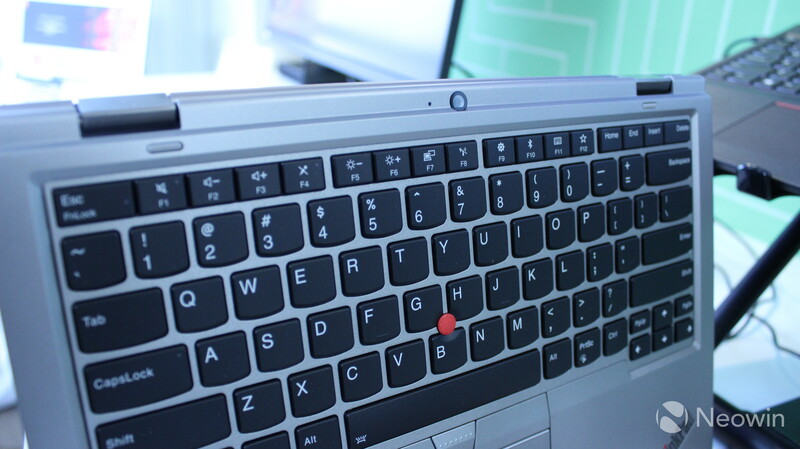 The fingerprint sensor is placed to the bottom-right of the keyboard, and there's a TrackPoint placed between the G, H, and B keys. 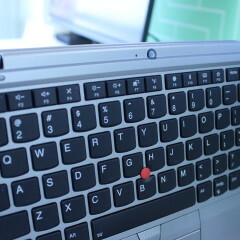 This can control the cursor with that and the dedicated buttons placed above the touchpad. 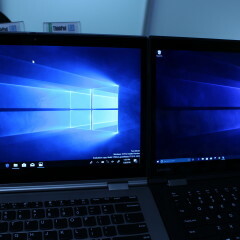 The display on the model that I was sent is a 14-inch IPS LCD with 10-point multitouch and pen support. I don't have a whole lot to say about it. 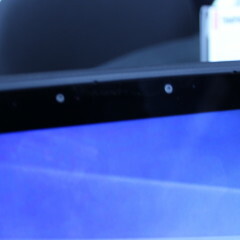 It's quite nice for a 1080p display, although it's very glossy so it's likely to catch a glare. 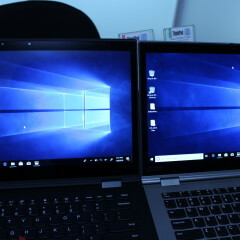 It also has a 16:9 aspect ratio, which I prefer for a productivity environment. 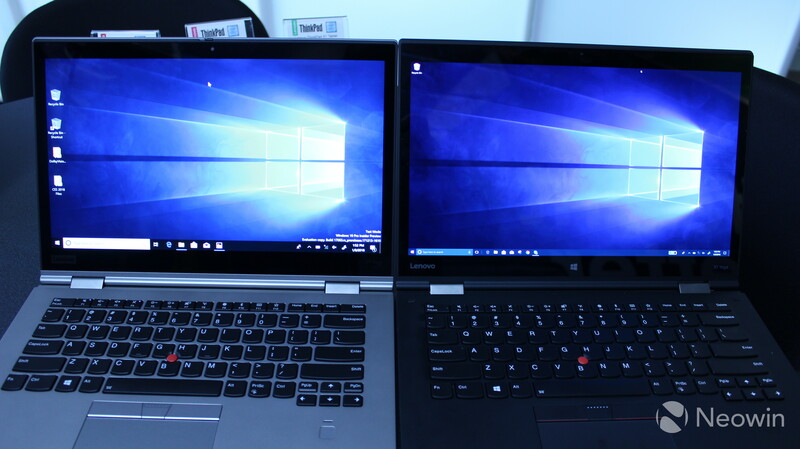 Some portable PCs like Microsoft's Surface devices go for 3:2, but I like a wider screen for splitscreen apps. 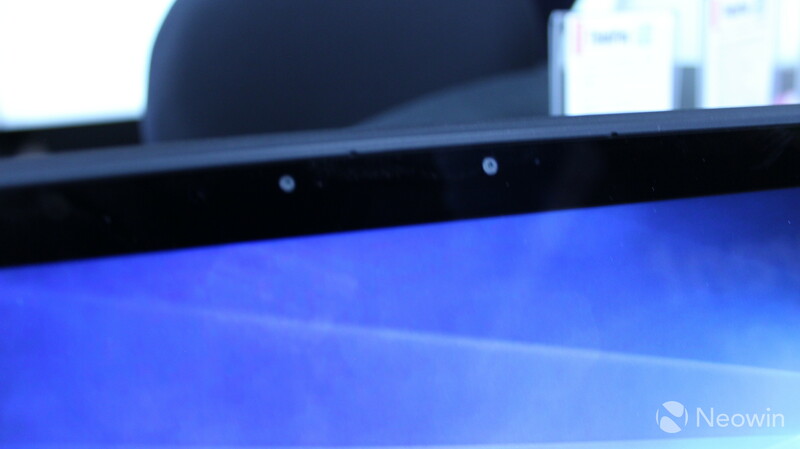 Of course, this is a convertible, and 16:9 doesn't work as well in portrait mode. 16:9 also works great for movies and TV shows though, so it's all a matter of preference. 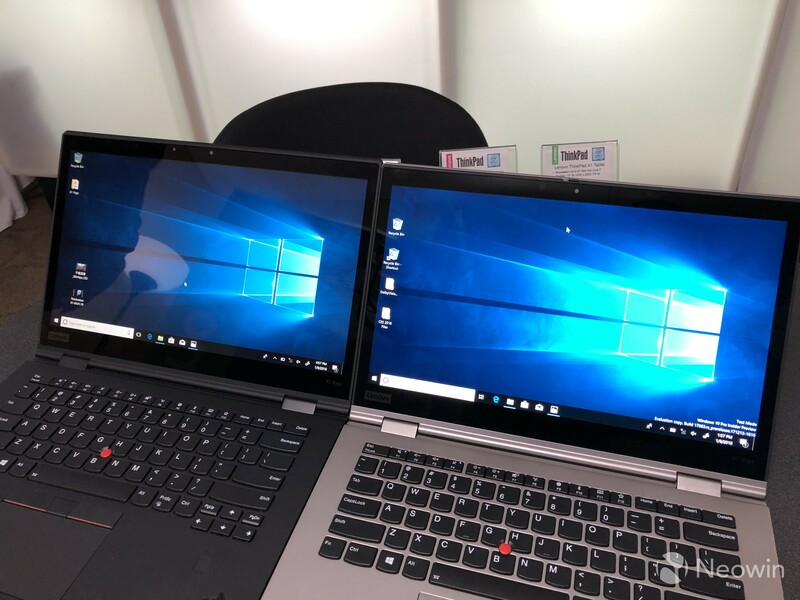 As I mentioned above, Lenovo went with a Dolby Vision model this year instead of OLED. According to the guys I spoke with, this is because OLED was a drain on the battery, which is a fair enough point. Still, I'd sacrifice battery life for that sweet, sweet OLED. 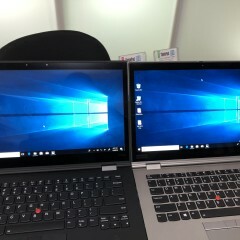 Still, I've only compared the two in a meeting with Lenovo, so I can't make a full assessment until I have one in my hands. 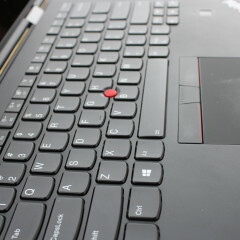 The keyboard is easily my favorite part of the ThinkPad X1 Yoga, although it's the same as it was last year. 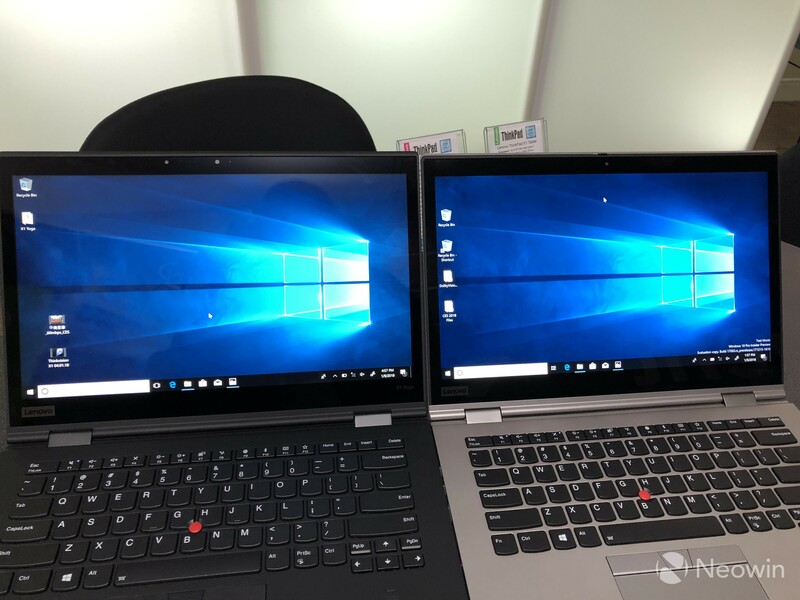 With other convertibles, you can fold back the display, but you can feel the keys getting in the way when you hold them, that that's kind of annoying. 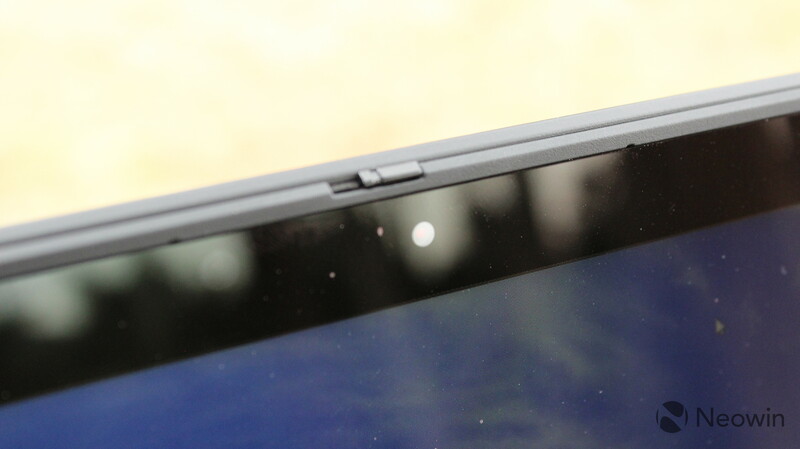 That's not the case with the X1 Yoga, as the keys actually retract into the device, leaving them flush with the surrounding area. As for actual typing though, it's quite a comfortable keyboard to type on. The keys are pretty quiet, which is great if you're a loud typist. They also seem to offer the perfect amount of resistance, so you don't get any missed strokes. 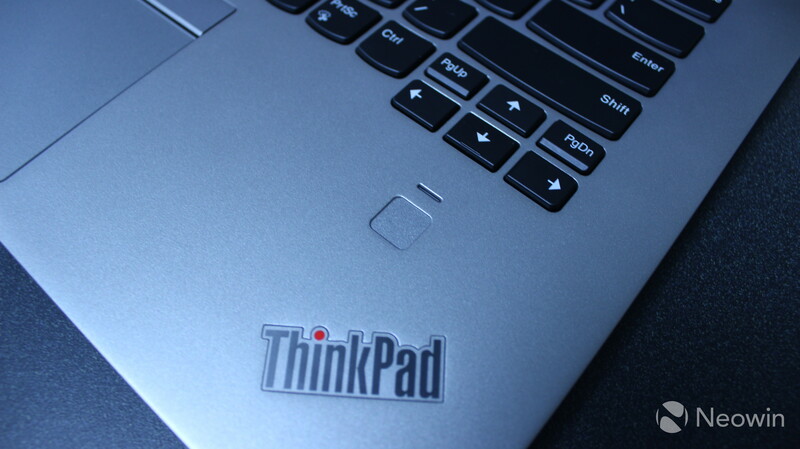 You have your choice in navigation methods on any ThinkPad, including the TrackPoint and the touchpad, or you can just plug in a mouse. 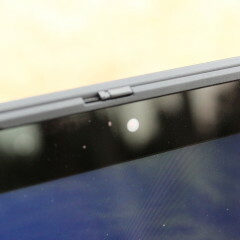 The touchpad is clickable, or you can use the three buttons above it. 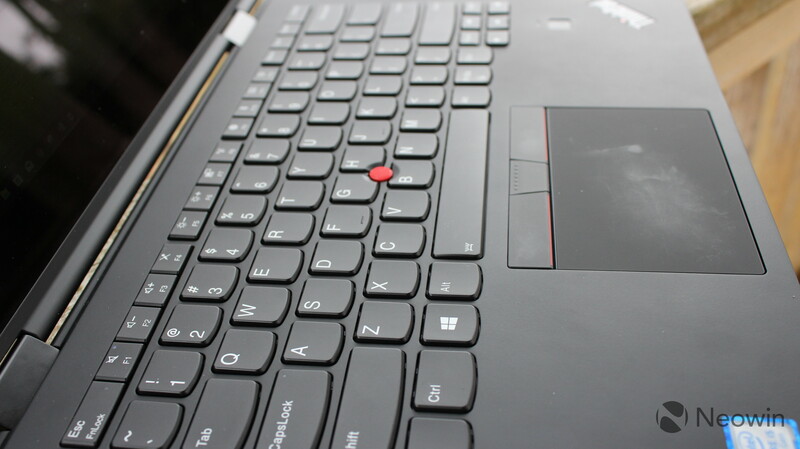 The middle button can be used for scrolling, so if you hold it and drag the TrackPoint up, down, left, or right, it will scroll the window that you're in. 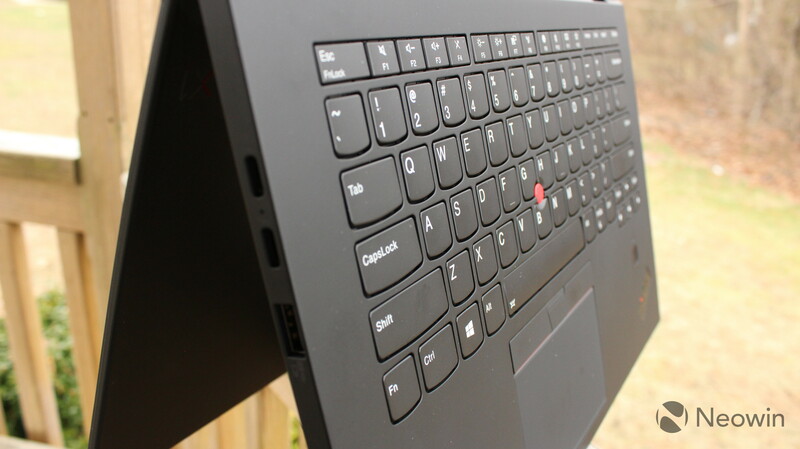 The ThinkPad Pen Pro is another feature that I love about Lenovo's ThinkPad X1 Yoga, for a couple of reasons. One is how the pen is stored and the other is how it charges. Different OEMs have different methods for pen storage. 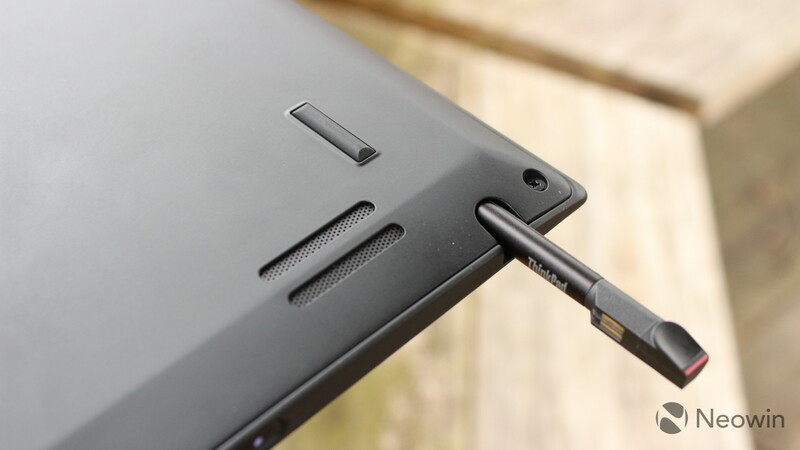 Microsoft has tried out a few in its Surface devices, such as attaching the pen magnetically to the side, magnetically to the charging port, and via an attached Pen Loop. 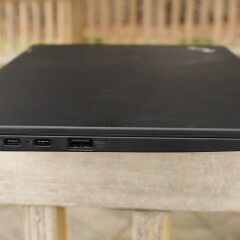 Other companies provide a clip in the box that connects to the PC by clipping onto the USB Type-A port. The issue with all of these is that they either take up a port, or fall off. 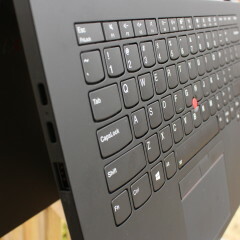 With the ThinkPad X1 Yoga, the pen is actually stored inside of the device. To make matters even better, it charges while it's in there, so charging isn't something that you ever have to think about. Other pens will either require a AAAA battery, or they'll recharge through micro-USB or USB Type-C. The only downside to this method is that the pen is smaller than most others. But good news! You can always go and buy a third-party pen if you don't like it. 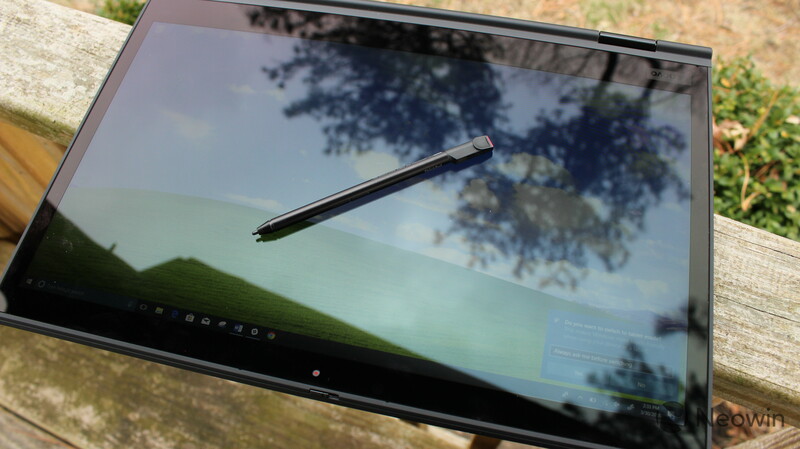 And of course, it's Windows 10, which means that there's plenty that you can do with the pen. The obvious use cases are drawing and taking handwritten notes, which are great on a convertible like this. 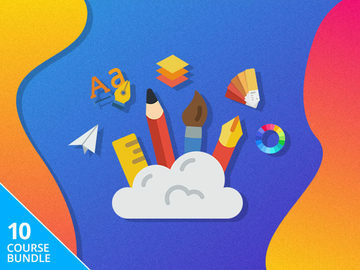 But you can also draw on images in the Photos app, leave notes for yourself in Sticky Notes, mark up PDFs and websites in Edge, draw routes in Maps, and more. My favorite thing to do is to sign documents, as it's so much easier than printing, signing, and scanning. Let's take a second to talk about audio quality because frankly, the speakers on last year's model sucked. If you tried to watch a movie on that sweet, sweet OLED model without external speakers, you were in for a disappointing experience. I'm very pleased to say that this isn't the case this year, as the third-gen model includes Dolby Audio Premium. 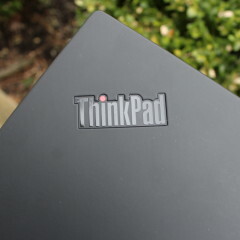 It's no Atmos, but at least it doesn't have that tinny sound that I've heard in previous ThinkPads. 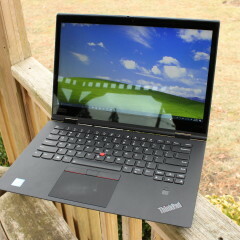 In fact, I've often found myself using the new ThinkPad X1 Yoga for watching movies or TV shows. For example, sometimes I'll set it up in tent mode while I'm making lunch or something and watch a TV show. 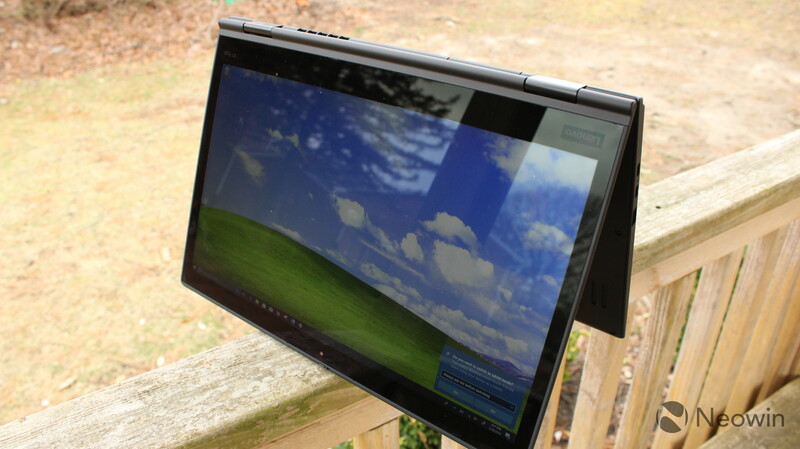 The point of providing that incredibly lame scenario is to show that it seems to me like the X1 Yoga is a true all-in-one mobile PC. It's great for getting work done as a laptop and for taking handwritten notes, but it's also good for play and watching movies now. 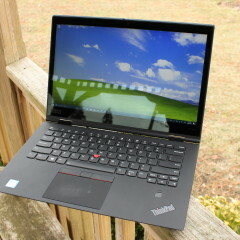 As I've mentioned, the Lenovo ThinkPad X1 Yoga is a PC that's great for everything. Being that it's a convertible, you can use it in a variety of form factors. 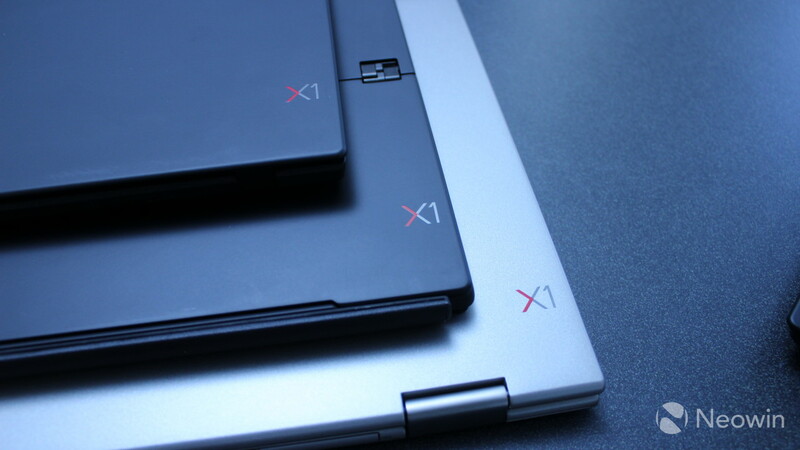 If you're like most people, the vast majority of the time you'll be using the X1 Yoga as a laptop. This is when the screen is at around a 90-degree angle, and it's how you get work done, obviously. 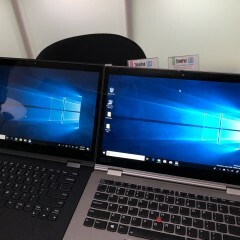 But if you fold the display all the way back, you can use it as a tablet as well. This is pretty important, because if you have no use for this, then you probably shouldn't buy this product. 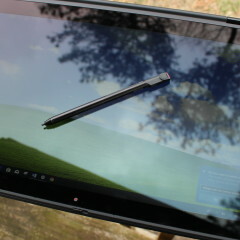 Tablet mode can be great for playing games or watching movies, but it's also the best way to work with the pen. Whether you're taking notes, drawing, or just signing a PDF, you're going to want to do it in tablet mode. 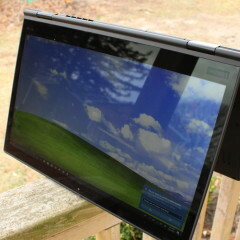 And then there's tent mode, which can be great for watching movies or doing a presentation. 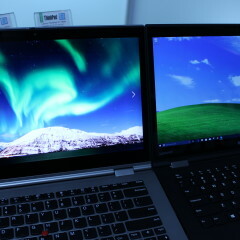 This also works by folding the display up while the keyboard is facing down. 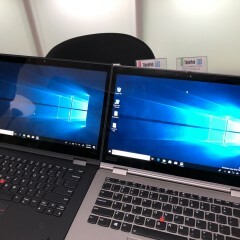 And if you are doing a presentation, you also have the option of using the HDMI port to connect to an external display. 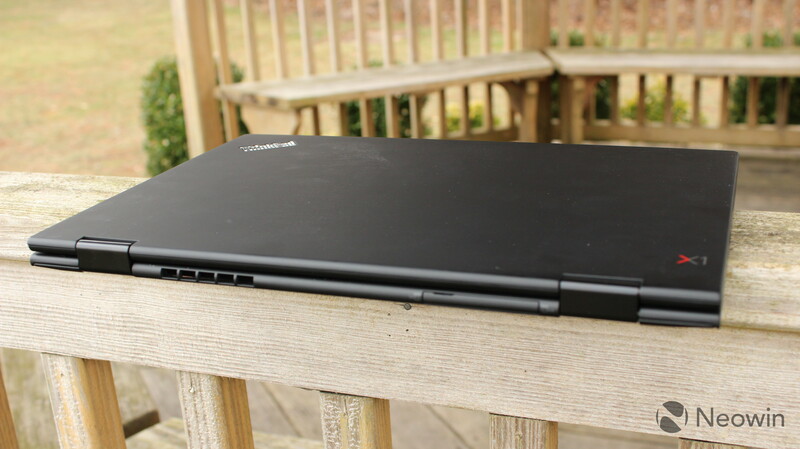 The ThinkPad X1 Yoga that Lenovo sent me includes an Intel Core i5-8250U and 8GB of RAM. 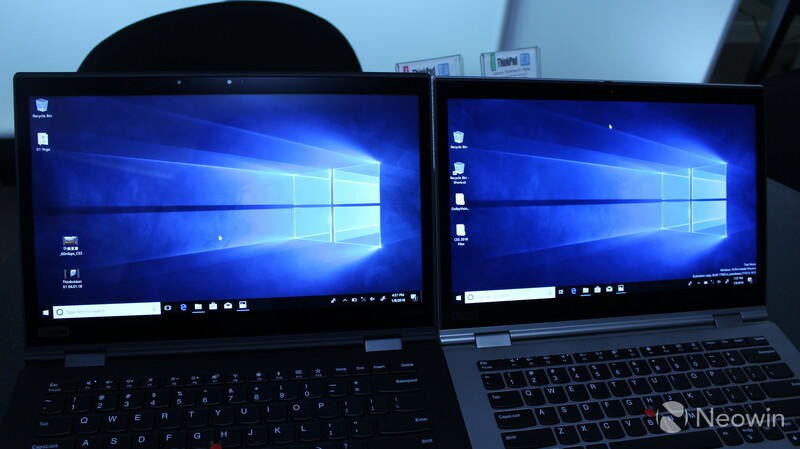 I didn't hit any performance issues in day-to-day use, and that includes working through the Chrome browser, with other apps like Skype, OneNote, and Slack open. I also use Photoshop pretty regularly, and that also went pretty well. It starts to choke a little bit if you try to edit and render video, especially when you go for the higher resolutions and frame rates. It's not impossible to do so, but the video will take a while to render, and I wouldn't recommend trying to use the machine while that's happening. 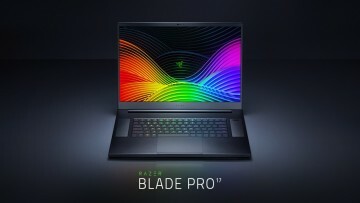 But still, it has 8GB RAM and no dedicated GPU, so this isn't surprising. 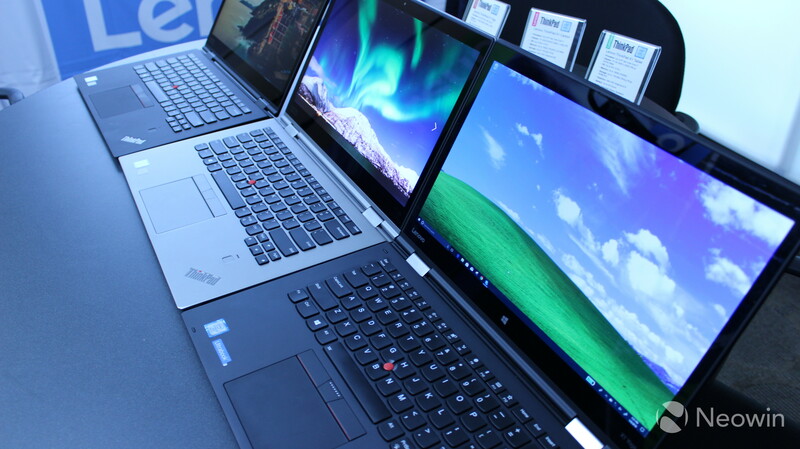 If you're looking to edit video, then you should probably be looking at a mobile workstation, or at least something with a dedicated GPU. 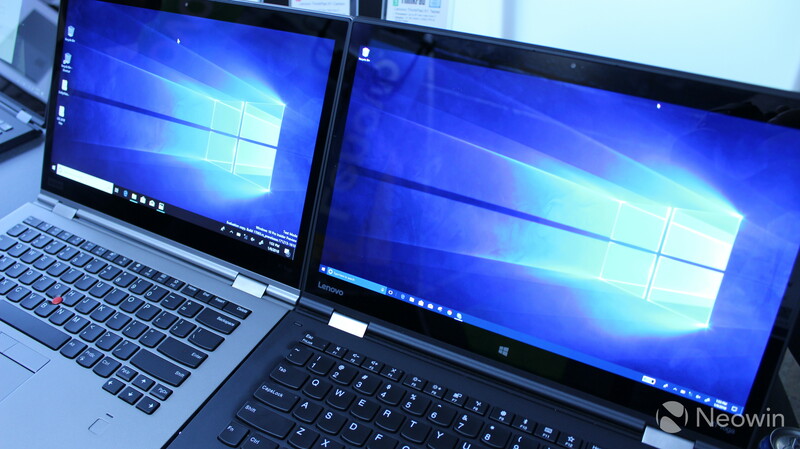 You'd also probably want to configure it with 16GB RAM. 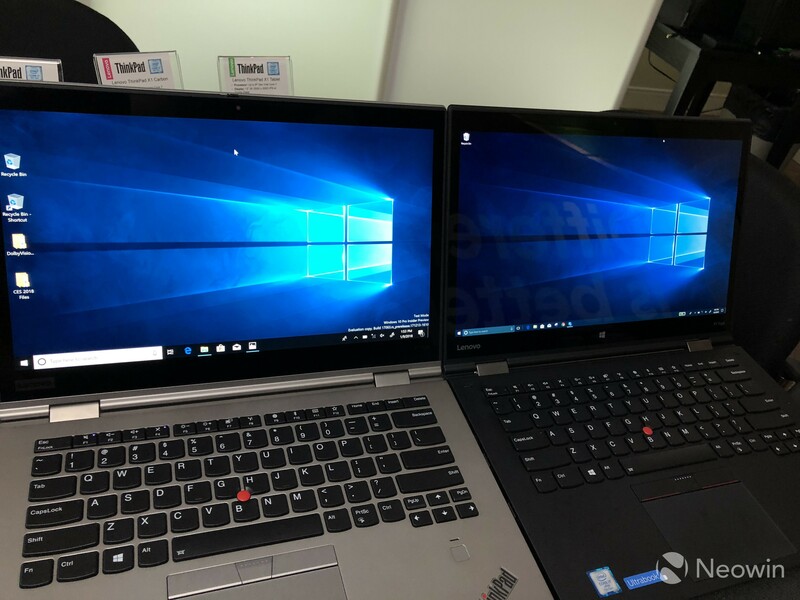 The point is that if you know you need a certain kind of performance, then you should already know if the X1 Yoga will meet your needs. For productivity, this machine is fantastic. 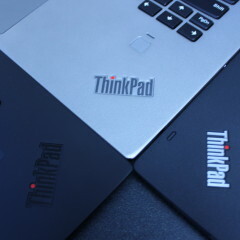 For benchmarks, I use PCMark 8, which offers three tests: Home, Creative, and Work. 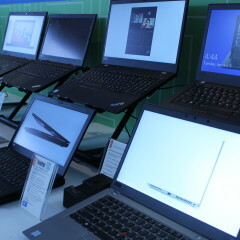 First up is Home, which checks common tasks like web browsing, casual gaming, video chat, and more. 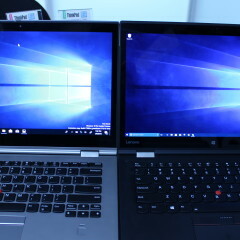 As you can see, the X1 Yoga scores about where you'd expect. 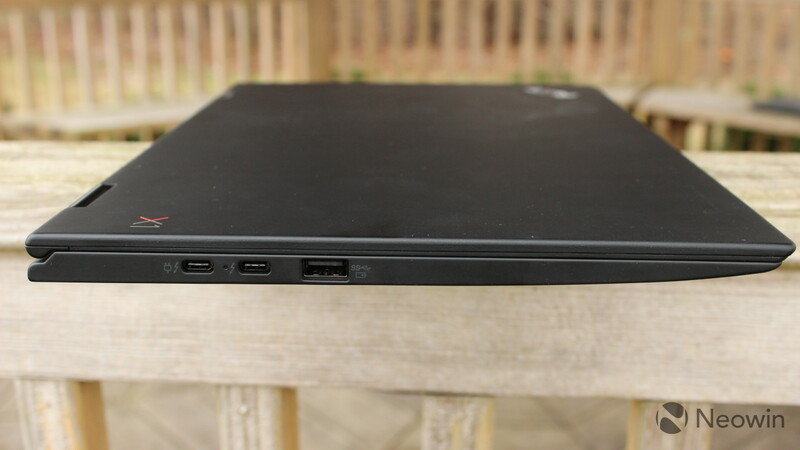 Obviously, it's not going to be on par with a gaming PC, which uses more powerful hardware. 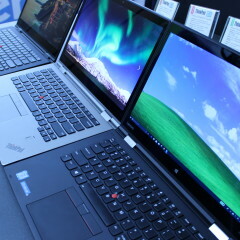 Next up is Creative, which tests things that are more GPU-intensive, like mainstream gaming, video editing, and more. Again, if you're looking to perform these types of tasks, you might want to be looking at something else. Finally, the Work test focuses on productivity-related tasks like writing and spreadsheets. 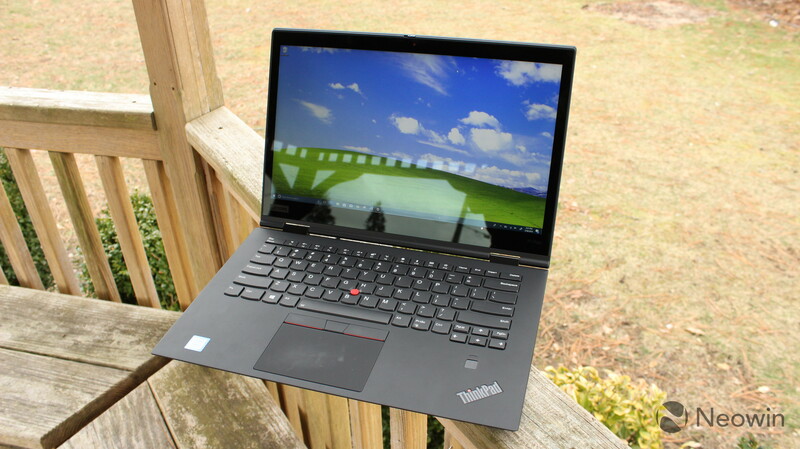 The Work test is where the X1 Yoga really shines, and that's not surprising. 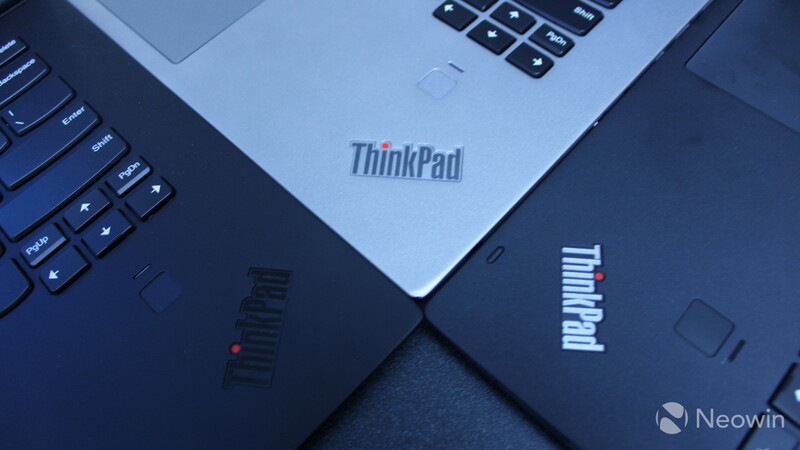 ThinkPads are engineered for productivity, and they're great at it. 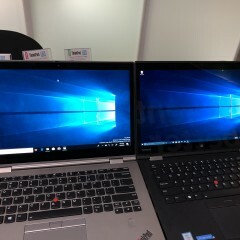 Did I mention that I love ThinkPads, and especially the X1 Yoga? Oh, you missed that part? Great! 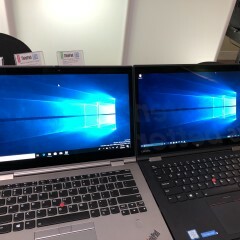 Well, I love ThinkPads, and especially the ThinkPad X1 Yoga. As far as laptop usage goes, the keyboard is extremely comfortable to type on, and that's one of the most important things for me. But as a convertible, it's even better. 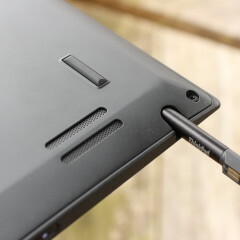 The pen is stored inside of the device, which is a far less bulky solution than competitors are using. 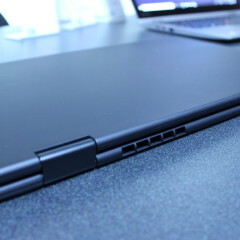 And the keys retract inside of the device when the display is folded back, for more comfortable usage. 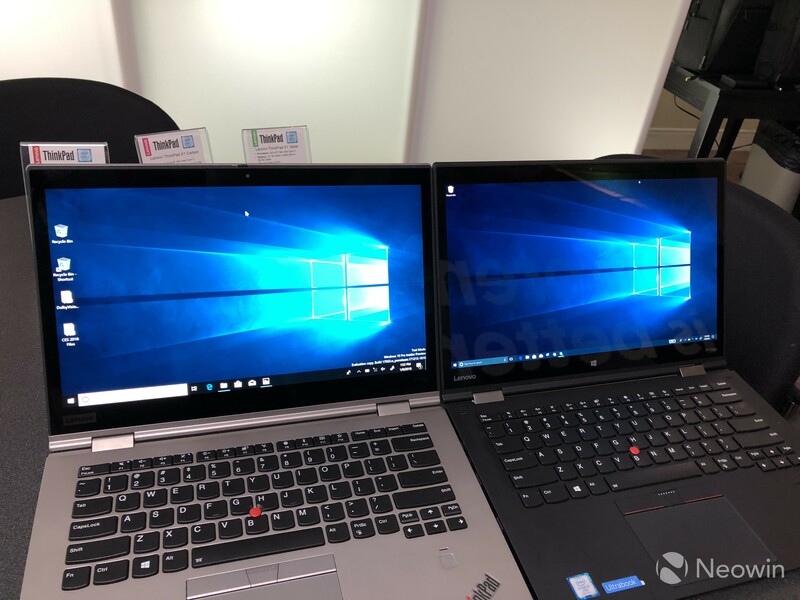 The ThinkShutter privacy guard on the camera is great, although I take issue with the fact that users are left with the choice between an IR camera for Windows Hello and ThinkShutter. 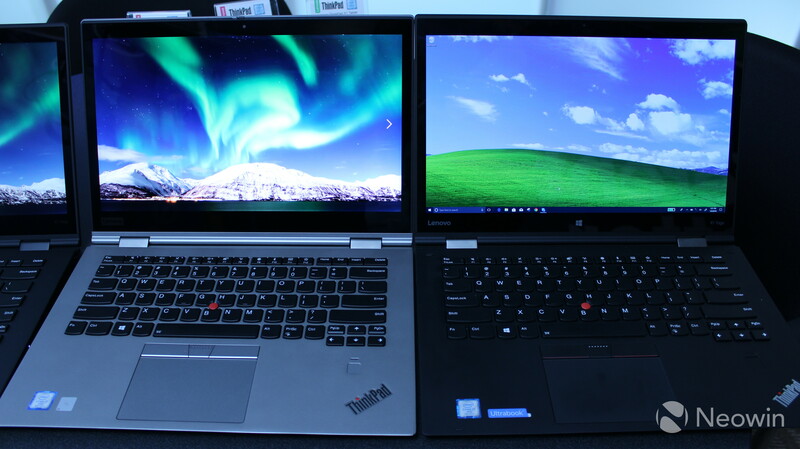 Both features are fantastic, and the consumer shouldn't have to choose between the two. Hopefully, this is solved in the next generation. 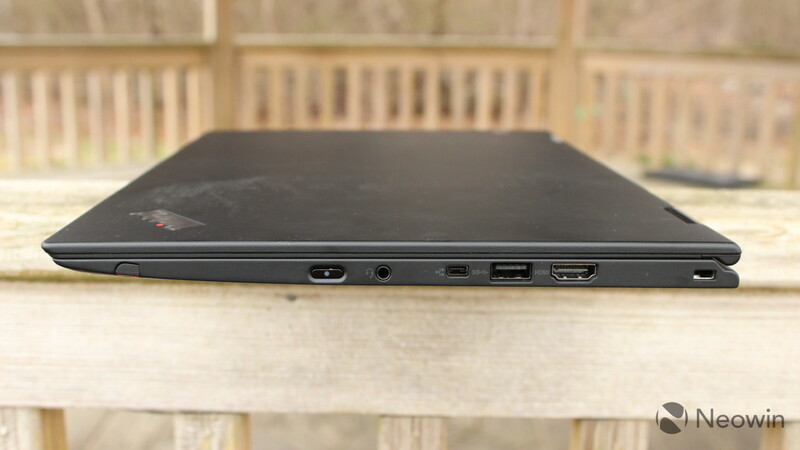 I also take issue with the fact that a USB Type-A port has been removed since last year. 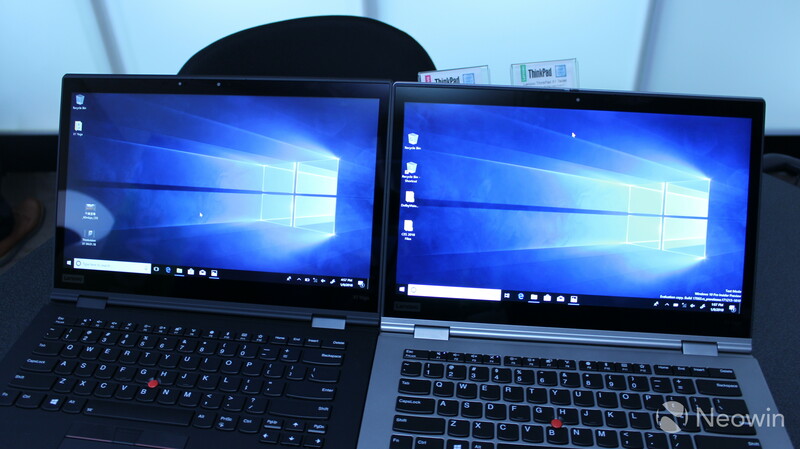 Two is probably enough, but an excess of ports can never be a bad thing. One other thing that I really want to point out is that the audio quality is so much better than last year. 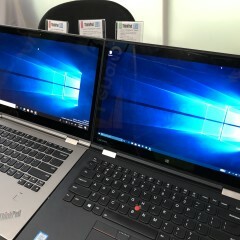 Frankly, it was terrible on the second-gen model, and now, you can reasonably watch a movie or listen to music on the X1 Yoga. 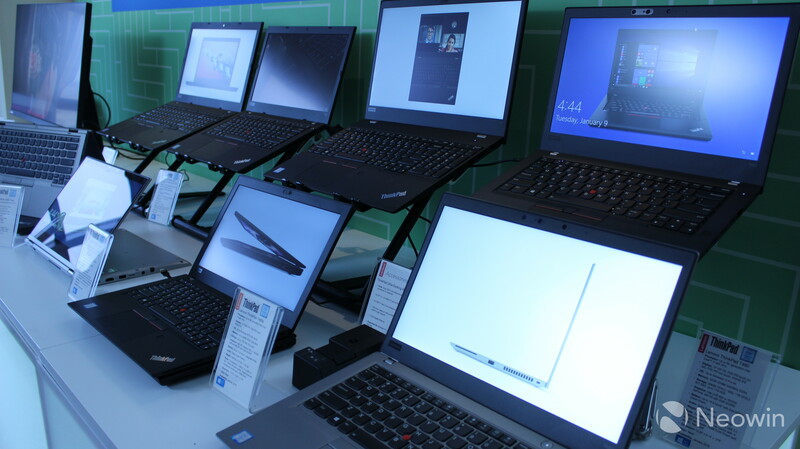 Lenovo's ThinkPads can be a little pricey, especially if you're going for the top-end model. 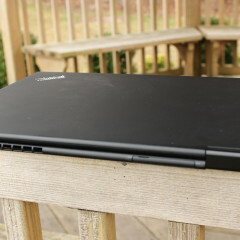 Still, I think that it's definitely worth it, and that the ThinkPad X1 Yoga is one of the best convertibles on the market.